Samuel Langhorne Clemens (November 30, 1835 – April 21, 1910), better known by his pen name Mark Twain, was an American humorist, essayist, novelist, and lecturer. The pseudonym "Mark Twain" comes from the river boat term meaning two leagues, or twelve feet. Twain said he loved the sound of the river boat pilot calling out "mark twain" because it meant safe water to a boat finding its way in the dark. Twain was a colorful figure who arrived on the literary scene during the period of Reconstruction, when America was expanding geographically and coming to terms with a transformed political and social landscape in the aftermath of the Civil War. Twain's sharp eye for detail and trenchant good humor were trademarks of his stories and sketches, featured in magazines and newspapers across the United States. A self-educated global traveler, Twain was an "everyman" who worked at sundry occupations, from riverboat pilot to gold miner. All his experiences contributed immensely to his works, as well as to his social critiques. As a journalist, travel writer, and novelist, Twain, like the poet Walt Whitman, helped fashion a new, distinctly American literature, characterized by realistic vernacular dialog and vivid rendering of everyday rural life. He became a celebrity in both the United States and Europe, known for his ribald humor, and biting, ironic critiques of social conventions. Many of Twain's novels are read to the present day for their realistic portrait of an earlier rural America, particularly from the often-ignored perspective of children. His best-known work, Huckleberry Finn, recounted the adventures of a raffish youth and his journey down the Mississippi with the escaped slave Jim. Recognized as a world classic for its irony, humor, original narrative voice, and compassionate humanism, the novel has grown increasingly controversial for its racially charged language and unequivocal social realism. In many of his novels and essays Twain upheld the inherent dignity of the marginalized—the slave, the impoverished—and wrote scathingly of the prejudice and exploitation of colonial powers. Twain was particularly outspoken in his criticisms of religious dogmatism and missionary evangelism. As his son, his wife, and two daughters died before him, his treatment of religion became increasingly bitter. His satiric, even mocking essays were so inflammatory that some were suppressed until after his death. Yet few people know that Twain anonymously wrote a long, reverential novel on the life of Joan of Arc, whom he saw as an authentic Christ figure untainted by the hypocrisies of formalized religion. Twain influenced social critics such as H. L. Mencken and humorist Will Rogers as well as novelists such as Ernest Hemingway and William Faulkner, who said of Twain, "[He] was the first truly American writer, and all of us since are his heirs." Samuel L. Clemens, was born in Florida, Missouri, on November 30, 1835, to John Marshall Clemens and Jane Lampton Clemens. He was born the year Halley's Comet entered earth's orbit and died the year it exited. Like the comet, Twain burst upon the literary world sometimes erratically, destination unknown, sparkling his witticisms like shooting stars on American readers. His most popular novels were the ones told from the perspective of a young boy coming of age in the deep South. Boyhood, marked by innocent but errant ways, was to be a common theme in his stories. From Twain's humble beginnings to his illustrious end dwells a larger-than-life story of an American author. When Clemens was four, his family moved to Hannibal, Missouri, a port town on the Mississippi River which later served as the inspiration for the fictional town of St. Petersburg in The Adventures of Tom Sawyer and Adventures of Huckleberry Finn. Missouri had been admitted as a slave state in 1821 as part of the Missouri Compromise, and from an early age he was exposed to the institution of slavery, a theme which Twain was to later explore in his work. The family was poor and Sam's father failed repeatedly in his business attempts. In 1847, when young Sam was eleven, his father fell ill with pneumonia and died. Sam left school with a promise to his Presbyterian mother that he would refrain from "imbibing hard spirits." Like the eponymous Huck Finn, he was a prankster who often found trouble: One story tells of Sam dropping an empty watermelon shell on his brother's head. Remarking on the incident later in life he said, "I have spent the last 50 years trying to regret it." He went to work as an apprentice typesetter with the Missouri Courier and for his brother Orion who owned his own newspaper, the Hannibal Journal. Seeking better wages, he headed East to work as a journeyman printer in New York, Philadelphia, St. Louis, and Cincinnati. He wrote humorous articles and newspaper sketches to fill copy space. At the age of 22, Clemens returned to Missouri and worked as a riverboat pilot until trade was interrupted by the American Civil War in 1861. He once remarked that riverboat piloting was the best time in his life. Life on the Mississippi, written in 1883, reflects an era when river experiences, simple and carefree, were central to his life. Missouri, although a slave state and considered by many to be part of the South, declined to join the Confederacy and remained loyal to the Union. A legendary, if not quite infamous, anecdote tells of Clemens and his friends forming a Confederate militia that disbanded after two weeks, and which he wrote about later in "The Private History of a Campaign That Failed." However, rather than join the Confederate Army, Clemens decided to follow his brother, Orion, who had been appointed secretary to the territorial governor of Nevada. They traveled on a stagecoach across the Great Plains and the Rocky Mountains to the silver-mining town of Virginia City, Nevada. On the way, they visited a Mormon community in Salt Lake City. Clemens' experiences in the West contributed significantly to his formation as a writer, and became the basis of his second book, Roughing It (1872), a richly detailed portrait of life on the American frontier. Once in Nevada, Clemens became a miner, hoping to strike it rich discovering silver in the Comstock Lode. After failing as a miner, Clemens obtained work at a newspaper called the Daily Territorial Enterprise in Virginia City. It was there he first adopted the pen name "Mark Twain" on February 3, 1863, when he signed a humorous travel account with his new name. In those days authors often chose pen names that were in marked contrast to their own personality. This certainly seemed the case with Samuel Clemens, the person, bound by more traditional conventions, while Mark Twain, the writer, was ever mocking the status quo and societal norms of the day. The contradiction between the private man, Sam Clemens, and the public persona of Mark Twain had begun. His lifelong friend, and literary adviser, William Dean Howells (then editor of the Atlantic Monthly and later an author in his own right) would always call him "Clemens." Regardless, his new name became nationally known when newspapers across the country printed his "tall tale," Jim Smily and His Jumping Frog (1865). This led to publication of his first book of stories The Celebrated Jumping Frog of Calaveras County and Other Sketches (1867). Throughout his life he would often chafe at being described in the press as a humorist, a "funny man" as he called it, when, in fact, he aspired to much more as a writer. His next adventure was landing an assignment as a San Francisco correspondent for the Sacramento Union, writing from the Hawaiian islands, then known as the "Sandwich Islands." When he returned he undertook yet another sideline, that of "platform entertainer." Utilizing his dramatic oratorical skills, Twain regaled audiences with his tales of the frontier and foreign places. He was soon in demand as a speaker at honorary dinners and banquets, something that would become a lifelong calling for him. Twain became the new star of the lyceum lecture circuit after filling the Great Hall of Cooper Union in New York City in 1866. The pen name "Mark Twain" was rapidly becoming a household word. His next assignment was once again that of a traveling correspondent, this time for the Alta California newspaper. Twain embarked on a six month cruise to Europe and the Holy Land on the boat The Quaker City. His letters from this trip later became the basis for the book The Innocents Abroad (1869)—considered the most popular travel book ever written. In it he pokes fun at tourists, the "innocents abroad," and their tendency to be at the mercy of their travel guide—and their prejudices—when encountering new situations. The Gilded Age (1872), written collaboratively with Charles Dudley was similarly a satirical treatise on American culture at the turn of the century. Twain was now a best-selling author and lecturer; tired of his itinerant lifestyle, he was ready to settle down. He said to his friend from the Quaker City cruise, Mary Fairbanks "I am going to settle down someday even if I have to do it in a cemetery." He was 31 years old and had been traveling for ten years working at a variety of printing and newspaper jobs. Fairbanks introduced Twain to Olivia Langdon (Livy), who came from a prosperous New York family. Their first outing together was at famed British author Charles Dickens' reading of his works in New York City. Late in life, Twain would comment, "From that day to this she has never been out of my mind." They were married on February 2, 1870, by Twain's good friend, the minister Joseph Twichell, in the Langdon's parlor. Livy's wealthy father helped the young couple to establish residence in Buffalo, New York, where Twain, with his father-in-law's backing, became part owner of the Buffalo Express newspaper. However, tragedy ensued when their first born son, sickly and premature, died at three months of age. They decided to leave Buffalo and moved to Hartford, Connecticut to be closer to Livy's family in Elmira, New York. They built a 19 room house at "Nook Farm" and the birth of their two daughters soon followed; Susy, in 1872, and Clara in 1874. Sam Clemens had come a long way from his early beginnings, living in a two room house and acquiring only a grade school education. He was now, partly through marrying well, welcomed into the literary and cultural milieu of the East Coast. Twain was in a comfortable position and ready to reflect on his raucous boyhood experiences in Hannibal, Missouri. His American classic, Tom Sawyer, was about to be born. He once referred to this novel as a "hymn to boyhood." By all accounts the Twain's family life was a happy one, spent entertaining in their large home in Connecticut, while summers were spent in Elmira relaxing and writing. The Victorian era, noted for its ornate fashions, was popular with the family, who sometimes dressed in costume when entertaining. Their days of contentment were due to fade, however, when hard times, both with finances and with health concerns, would besiege the family during the next decade. 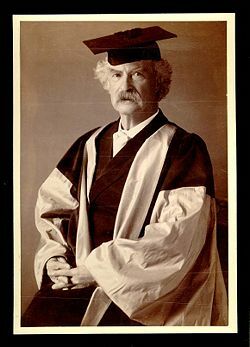 Mark Twain in his gown for his DLitt degree, awarded to him by Oxford University. Although The Adventures of Huckleberry Finn received more critical and financial acclaim than did The Adventures of Tom Sawyer, it was also greeted by a storm of controversy due to its explicit vernacular related to the themes of race and slavery. Unlike the stiff and formal prose of the Victorian genre, Huck Finn depicted language and life more realistically as it was in the nineteenth century. In 1885, when a library in Concord, Massachusetts banned the book, Twain commented philosophically to his publisher, "They have expelled Huck from their library as 'trash suitable only for the slums'; that will sell 25,000 copies for us for sure." This literary masterpiece took Twain seven years to complete. Through telling the story of a young boy coming of age during the era of slavery, he combined rich humor and sturdy narrative with social criticism. Twain was a master at rendering colloquial speech, and helped to create and popularize a distinctive American literature built on American themes and language. Ernest Hemingway was quoted as saying, "All modern American literature comes from one book by Mark Twain called Huckleberry Finn. …all American writing comes from that. There was nothing before. There has been nothing as good since." Two of his books, The Prince and the Pauper, written in 1881 and, A Connecticut Yankee in King Arthur's Court (1889), were set in Tudor England. The first is the story of two look alike boys; one is a prince in royal English society and the other a pauper. After an inadvertent meeting, they trade places, and learn that the differences in their lives involve far more than just the trading of robes and rags. The themes of social class and unfairness were favorite ones for Twain. So was the idea of switched identities as in the book, The Tragedy of Pudd'nhead Wilson and the Comedy of Those Extraordinary Twins (1894), an unfolding tale of the mix-up of two babies, one slave and one free. Although not very popular among Twain's contemporaries, it presents, in comparison to his other works, the most sustained treatment of slavery. The book, A Connecticut Yankee in King Arthur's Court, is about a time traveler from the America of Twain's day, using his knowledge of science to introduce modern technology to Arthurian England. Although generally well received, some Britons flinched at the irreverent tone of the book towards royal monarchy and its traditions. Twain, unfortunately, like his father before him, was not an adept businessman. He lost money through his experimentation with new inventions, like the Paige typesetting machine. A publishing company venture, established to publish the memoirs of Ulysses S. Grant, soon folded. Faced with mounting debt and the specter of bankruptcy, he and Livy were forced to close the house in Connecticut. Twain decided to do what he was best at, lecturing, touring, and writing, in order to pay off his debts. Leaving their daughters in boarding school and college they set sail for Europe. Twain was to live abroad for a long period of time before being able to return home to the United States for good. In 1900, he paid off his debts and returned to the United States, a conquering hero. The world lecture tour, in which Twain visited India and Australia, among other countries, was interrupted by tragedy when their oldest daughter, Susy, died back home in Connecticut of spinal meningitis. The entire family was overcome by grief. This episode would color Twain's later writings with pathos and dark humor. Soon, other trials ensued. Always in frail health, Livy died in 1904. Jean, their third and youngest daughter, plagued by a lifetime of seizures, died on Christmas day in 1909. Although these were difficult years for Twain he was buoyed by the success of Following the Equator and Anti-imperialist Essays (1905), based on his world tour, and by his popularity overseas. It was during this time, when the press was speculating constantly of his troubles and failures, that he remarked sardonically, "Reports of my death have been greatly exaggerated." Twain's biographer has said that the rest of his life was a standing ovation. He was often seen at special events, like daughter Clara's wedding to pianist and composer, Ossip Gabrilowitsch, wearing his ceremonial robes (he received an honorary degree from Oxford University in 1907) or strolling down Fifth Avenue in New York, an enigma in one of his signature white suits. Beset by illness and heart trouble (angina pectoris), he sought refuge in travel, as he had often done in the past, and spent some of his final days in Bermuda. 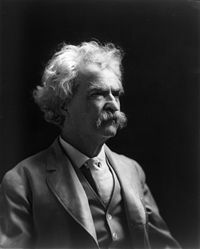 Samuel L. Clemens—"Mark Twain"—returned from Bermuda to his Connecticut home, "Safe Waters" at last, where he died on April 21, 1910. The year before his death Mark Twain was quoted as saying: "I came in with Halley's Comet in 1835. It is coming again next year, and I expect to go out with it. It will be the greatest disappointment of my life if I don't go out with Halley's Comet. The Almighty has said, no doubt: 'Now here are these two unaccountable freaks; they came in together, they must go out together.'" Some of Twain's writings, suppressed during his lifetime because of their controversial tone and the objections of his family members, were published posthumously. His collection of short stories, Letters from the Earth, wasn't published until 1962. Twain did not attempt to publish his book, What is Man? until after his wife Livy died. Both of these books, and other later works, express his iconoclastic views and growing despair towards both God and man. Despite his often acid reflections on religious orthodoxy and the baleful influence and patronizing attitudes of missionaries, Twain anonymously wrote a long, reverential novel on the life of Joan of Arc, which he considered his greatest and most important work. Twain saw in the slight figure of the untutored French girl, raised from obscurity by the unseen hand of God to lead the French army, an authentic Christ figure untainted by the hypocrisies of formalized religion. "I like Joan of Arc the best of all my books, and it is the best," Twain wrote; "I know it perfectly well. And besides, it furnished me seven times the pleasure afforded me by any of the others; 12 years of preparation, and two years of writing. The others needed no preparation and got none." Many movies, particularly those for television, have been made from Mark Twain's books. An early Prince and the Pauper movie starred Errol Flynn and Claude Rains (1937). The Adventures of Huckleberry Finn has been produced a number of times; one of the most recent is a 1993 movie with Elijah Wood, released on DVD in 2002. A 1995 version of A Connecticut Yankee in King Arthur's Court starring Keshia Knight Pulliam was released on DVD in 2003. Many of Twain's works were turned into plays over the years. The first Broadway production of one of his works was in 1895, when Pudd'n-head Wilson was performed at the Herald Square Theater. The Broadway Musical Big River was based on Twain's The Adventures of Huckleberry Finn. With a musical score written by country artist Roger Miller, it won the Tony for Best Musical in 1985. Hal Holbrook's uncanny imitation of the author can be seen on DVD as he performs Mark Twain Tonight, a one-man stage show he did for many years. (1876) A Murder, a Mystery, and a Marriage (fiction); (1945, private edition), (2001, Atlantic Monthly). Works by Mark Twain. Project Gutenberg. More than 60 texts are freely available. Mark Twain Quotes, Newspaper Collections and Related Resources. Twain on The Awful German Language. Mark Twain and the Mississippi. Full text of the biography Mark Twain by Archibald Henderson. The Mark Twain House in Hartford, CT. The Mark Twain Boyhood Home in Hannibal, MO. Mark Twain Prize for American Humor. This page was last modified on 28 May 2013, at 14:52.